Night vision technology has grown to encompass a few distinct types of equipment, each of which has its own strengths and weaknesses. Night vision devices, or NVD’s for short, allow the human eye to see in total or near total darkness through the use of two basic methods, light amplification or thermal imaging. These systems are further classed into what are considered passive and active systems, wherein a passive NVD makes use of whatever light is available, and an active system requires an external infrared light source. While light amplification devices can be either passive or active, thermal imaging devices are 100% passive systems. Rather than rely on “light” to form an image, thermal imaging systems rely on the heat energy radiated by animals, human beings, and objects, and contrasts the differing heat levels with the temperature of the surrounding environment to produce an image. For our purposes here, we’ll be focusing on light amplification devices and leaving thermal imaging for another time in order to preserve brevity. In passive night vision devices, any available ambient light from the moon, stars, and unnatural light sources is gathered within the device, amplified, then displayed on a screen, allowing the user to see when there is very little visible light available. Passive NVDs are generally sensitive to light over a wide range of the light spectrum, allowing them to make the most use of whatever light energy is available. Thus, even if it is dark and very little visible light is present, the NVD is able to utilize parts of the light spectrum that are not visible as well, allowing it to gather more light energy with which to form an image. In active NVDs, a source of non visible light which the device can “see”, in this case light within the infrared end of the light spectrum, is used to illuminate an area. The device can register this normally invisible infrared light just a human can see visible light. This infrared light is then processed within the device to increase intensity and clarity and produce an image on a screen that allows the user to see in complete darkness. Most modern non military NVDs, particularly civilian security systems and hunting equipment, are primarily passive light amplification systems. These systems resemble a digital video camera in appearance, and operate in a similar fashion. The difference, however, is that NVD’s use special lenses and processing to change light energy as it enters the device from photons into electrical energy or “electrons”. This electrical energy is then sent through a very thin disk of special materials, which in turn creates even more electrons. All of these added electrons are then passed onto a phosphor coated screen which turns them back into photons, thus producing an image the user can see. The result is the creation of an image from what is normally far too little light for the human eye to effectively see with. The drawback with passive NVD’s is that there must be some amount of ambient light available in order for them to work. In total darkness, or in situations where there is almost no light at all, passive NVDs’ will not be able to produce an image of decent quality and suffer from dark spots and poor image resolution. Active NVDs, rather than amplify available light, are designed primarily to see light in the invisible infrared end of the light spectrum. They operate very similarly to normal cameras, but rely on invisible rather than visible light to produce an image. 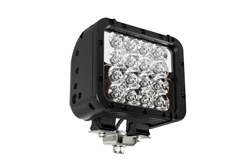 Since infrared light of itself is not available in sufficient amounts to produce an effective image at night or in total darkness situations, an external source of IR light is employed. Just as you would use a normal light to illuminate a room, an IR light is used to illuminate an area with light that only the active NVD can see. This IR light is then processed within the device and used to produce an image on a screen. The drawback with active NVDs is that there must be an IR light source paired with the device in order to produce an effective image. This means added hardware and power requirements, and in covert or military applications, that anyone with IR goggles or similar night vision technology will be able to see the NVD user’s IR light as well. The development of practical night vision technology began in WW2. The first designs were active systems and relied entirely on a source of projected IR light energy to produce an image. These were large, cumbersome systems and although they provided the first practical night vision capability, had problems with image distortion and saw limited use in warfare. The infrared lights used with these systems were produced by placing filters over normal lamps to filter out visible light and allow only light in the near infrared end of the light spectrum to pass through. These first IR NVD systems represent Generation 0 NVD’s and are now obsolete and no longer in use. After WW2 NVD development continued and by the 1960’s the first passive NVDs that did not require an external infrared light source were being used in Vietnam. These systems were an improvement on Gen 0 technology and were able to use available ambient light to produce an effective image. These systems had poor sensitivity and light amplification capabilities compared to modern NVDs and required a significant amount of ambient light in the form of moonlight and starlight to operate effectively. These systems had a sensitivity to light energy that did not extend very far past the 400-800Nm range, thus limiting the amount of ambient light they could utilize. On cloudy or poorly lit nights, GEN 1 NVDs were for most intents useless unless an external infrared light source was used as well to augment ambient light levels. Like GEN 0 NVDs, Gen 1 systems had poor resolution and problems with distortion. GEN 1 led to what famously became known as starlight scopes. Generation 2 NVDs brought about the first truly effective NVDs and featured greatly improved light intensification and image resolution capabilities. Better materials and improvements in cathode tubes allowed these systems to produce thousands of times higher amplification than GEN 1 systems while being lighter in weight and much longer lived. Additionally, the sensitivity of these NVDs increased to include higher ends of the infrared spectrum, allowing them to make better use of non visible light as well as visible light. Infrared sensitivity for GEN 2 systems increased to approximately 850nm, thus increasing the available amount of ambient light available to them. Further improvements in optics, light amplification and materials led to what is known as GEN 2+ systems, but for the most part, most GEN 2 systems are at their basic level similar in performance. GEN 2 systems produce light amplification levels of approximate 20,000x. Generation 3 NVDs are the modern systems now in use and have seen several improvements since their inception. GEN 3 NVDs improved on the performance of GEN 2 systems with much better light amplification abilities derived from the use of Gallium Arsenide in the photocathode and an ion barrier coating on the disk which converts photons to electrons to allow greater electron production. Later improvements allowed the systems to automatically adjust to ambient light levels, reduce signal noise, and operate at very low ambient light levels. Sensitivity of GEN 3 systems was also increased to include more light from the infrared end of the light spectrum up to 950-Nm, thus increasing the amount of available ambient light the system could use. GEN 3 systems can produce light amplification levels of 30,000–50,000×. All generations of NVDs rely on the presence of light to produce an image. Additionally, all generations of NVDs are sensitive to light across both the visible and infrared range of the light spectrum, but this sensitivity varies among each of the Generations. This is because developers recognized that IR light quantities can exceed visible light quantities at night, thus as each generation of improvements came about, developers sought to increase sensitivity to a wider range of the light spectrum farther into the infrared. GEN 0 systems relied entirely on IR light and thus were entirely active NVD’s. GEN 1 systems produced the first passive NVDs, but they required significant amounts of ambient light to be effective. Old GEN 1 systems are now often enhanced with the addition of infrared light LED lights in the 800-850Nm range in order to improve their imaging capabilities. This is a popular approach today with the general public who purchases an obsolete GEN 1 NVD for hunting because of their cheap price and wants to maximize its performance. GEN 2 and GEN 3 NVDs generally do not need an active infrared light source to augment their capabilities. However, problems with poor weather conditions, smoke, fog, or clouds, or the need for increased visibility ranges can be alleviated with the inclusion of infrared light sources in the 800-850 Nm range for GEN 2 systems and 900-940Nm for Gen 3 systems in order to maximize these imaging systems potential.